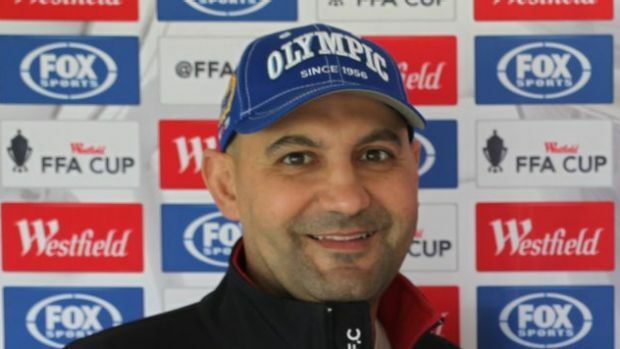 Canberra Olympic coach Frank Cachia said a national division-two football competition with a promotion and relegation system to feed the A-League is unlikely to succeed. The eve of the A-League season and the latter stages of the FFA Cup prompt the yearly discussion about the need for a national second-tier competition to increase the talent pool, but Cachia said the creation of greater regional divisions would be more realistic financially. "The biggest thing for me with a second division is you need to have teams in there that are ready to step into the A-League if they do win promotion," he said. "The reality is, with anything like that, it costs because clubs would have to fund travel and player payments." Cachia – whose team will play in an FFA Cup quarter-final next week against Melbourne's Green Gully – said two to three smaller divisions nationwide would provide a sustainable and competitive pathway for local footballers heading towards professional careers. In this format a Canberra team would play in a division incorporating Sydney, regional NSW including Wollongong and Brisbane and the Gold Coast. Therefore, Victoria, Adelaide, Tasmania and possibly Western Australia would make up another one or two divisions. Cachia said local clubs and fans would need to be unified to support a Canberra United or similar construction to eventually have a presence in the A-League. He said this was the path most likely to one day get an elite team filled with local players and coaches in the national competition. "There is always going to be clubs or members of clubs that would rather see the local team lose because they favour their own team, and that's fair enough. Any move in that direction would have to be a unified approach, and that's going to be difficult wherever you are, not just in Canberra," said Cachia. One of the complaints against the lower divisions in Australia is it becomes too difficult to sort through talent prospects, which means it is more unlikely for players in lesser-known state leagues to be noticed by A-League scouts. Therefore, a Canberra presence in a more advanced second tier would allow local players a greater opportunity to prove their worth. "As long as it's enhancing the local game and not taking away from it, then I'm all for it, 100 per cent," Cachia said.